Following seasons in Adelaide, Edinburgh and St Petersburg, Russia, CHAMBER POT OPERA has returned to Sydney to play in Australia’s foremost Opera venue, the Sydney Opera House. The big thing about this event is that it takes place not in the main Opera Theatre but the opera took place in the Ladies Bathroom next to the Playhouse Theatre. The premise is that a lot of meaningful interactions take place in women’s public bathrooms so why not make it the setting for a small piece. 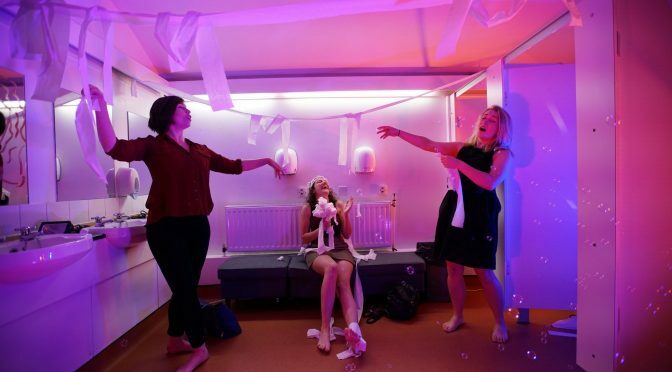 CHAMBER POT OPERA tells the story of three women who meet for the first time in a public bathroom. One is in an abusive relationship and is a bit suicidal, another is terrified that she has come on too strong on a date, and the third has been promoted through the glass ceiling to land her dream job. Together there is a synergy and they sing songs using a catalogue of popular music from the operas of Puccini, Mozart and Bizet. A uniquely intimate production, CHAMBER POT OPERA the three performers utilised the entirety of the splendid and intimate space from the bathroom sinks and decorative mirrors to the hand dryers and toilet stalls to weave together a story in a setting where women safely express themselves. They were accompanied by a young woman on keyboards together with a young man who found a little nook to run the show’s bio box, There were very feint, difficult to read surtitles streamed on the wall facing the audience. CHAMBER POT OPERA featured a talented team of singers and creatives from NIDA and the Sydney Conservatorium of Music. The cast included Sally Alrich-Smythe (The Phantom of the Opera), Britt Lewis (Rent) and Jessica Westcott (La Bohemeº) who were all in good voice. The show has been created by Clemence Williams and Thomas De Angelis who was also the show’s dramaturg. Thomas De Angelis. Keiren Brandt- Sawdy was the show’s pianist and musical director . The production is in line with the Sydney Opera House’s commitment to new and adventurous work by young artists. Recommended as an original,, very different opera experience CHAMBER POT OPERA is playing The Playhouse Ladies Bathroom at the Sydney Opera House until the 28th April. Performances are 7pm and 8.30pm. The performance goes for 45 minutes. Ticket prices are only $55 and $45 concession.